Jasmine is a New York socialite and the widow of a very wealthy man (played by Alec Baldwin), who finds herself moving into her sister's apartment in San Francisco until she can get back on her feet. That actually sounds like a pretty decent place to start a story but as the film goes on, we learn more and more about how and why Jasmine got to be in the situation she's in and it becomes about impossible to like or feel for the character. Her sister Ginger (Sally Hawkins) on the other hand is someone the viewer can connect with and feel good or sorry for at differing points of the film. Ginger's very lower-middle class life is thrown into chaos when her high society sis moves in and she finds herself fighting Jasmine's judgments and her own self doubt. Both Blanchett's and Hawkins' performances are well worthy of their respective Oscar nominations. 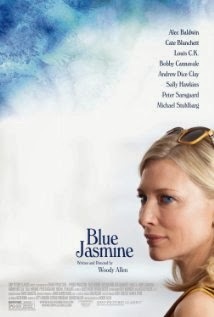 I may not like Jasmine as a character, but her neurosis is played brilliantly by Blanchett. It is easy to see why she's been cleaning up the Best Actress category so far this awards season. Hawkins is probably a long shot in the Best Supporting Category, but Ginger provided a much needed balance to Jasmine in this story. Unless you're a fan of Woody Allen's work, or are just curious about the performances by Blanchett and Hawkins, I wouldn't recommend running out to see Blue Jasmine. That is unless you enjoy films about people whining about tough situations that they had more than a hand in contributing to in the first place.